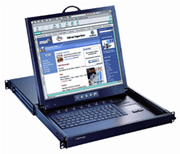 Compatilbity Multi-platform: Mix PCs, SUNs, IBMs, HPs & DELLs. KVM port: 32-port RJ45 female connector. ** need one RJ45 cable and one Dongle (USB or PS/2 type) to connect each target computer (not included).